Automatic trade execution with leading brokerages though a number of gateways to all major world’s exchanges. 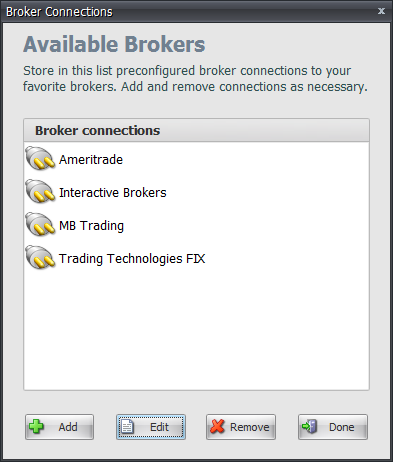 Configurable connection to multiple brokers on the same terminal. Manual and automatic trade execution. StockFusion supports manual and automatic algorithmic trading through your TD Ameritrade account. TD Ameritrade provides investing and trading services for nearly six million client accounts that total more than $600 billion in assets, and custodial services for more than 4,000 independent registered investment advisors. With clients placing, on average, approximately 400,000 trades each day, it maintains the leadership position it assumed when founder Joe Ricketts opened his doors in Omaha, NE, in 1975. StockFusion supports manual and automatic algorithmic trading through Trading Technologies FIX gateway. Trading Technologies has been a leader in the fast-paced world of high-performance electronic trading since the first version of our flagship product, X_TRADER®, launched in 1994. Our innovations allow professional traders in virtually any location to access and trade the global derivatives markets from a single computer screen. Explore the links below to learn more about TT. StockFusion supports manual and automatic algorithmic trading through your Interactive Brokers account. Interactive Brokers conducts its broker/dealer and proprietary trading businesses on over 100 market destinations worldwide. In its broker dealer agency business, IB provides direct access (“on line”) trade execution and clearing services to institutional and professional traders for a wide variety of electronically traded products including stocks, options, futures, forex, bonds, CFDs and funds worldwide. Interactive Brokers Group and its affiliates execute nearly 1,000,000 trades per day. StockFusion supports manual and automatic algorithmic trading through your MB Trading account. MB Trading is a direct access brokerage firm that develops and markets sophisticated yet simple direct access trading technology to online investors, institutions, and qualified destinations. Using a proprietary order routing system, MBTX, the company allows investors to bypass the middleman and trade directly to the NASDAQ, NYSE and AMEX markets, as well as offering direct access executions in the futures and options arena. In addition, MB Trading Futures, the registered Retail Foreign Exchange dealer (RFED), offers customers direct access to a plethora of qualified destinations of liquidity in the forex markets without the usual burdens of a deal desk.